Friday evening, time to relax after a busy week at work in the day job. Time for a wee dram of Islay Single Malt Whisky. And time for a (possible) regular feature: The Friday Islay Picture. 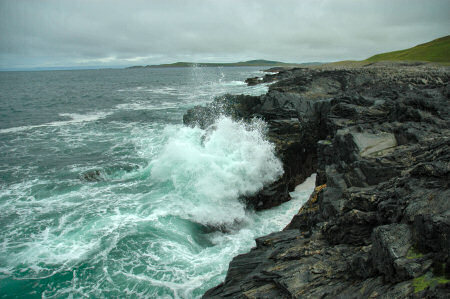 This picture shows waves breaking on the rocks at Rubha na h-Airde Móire, which is near Kilchiaran Bay. The view is looking north, towards Machir Bay. You can see Carn Mór and Cnoc Mór in the distance. It is also a preview for what I'm hoping to work on this weekend: After the beautiful sunny morning in Port Charlotte, Islay it unfortunately clouded over during the afternoon. Nevertheless I had a quite nice afternoon at Kilchiaran, looking at the disused slate quarry, the western shoreline and Kilchiaran Bay.